When your smoke detector goes off while you’re trying to relax under a steady stream of hot water, it can be a frightening jolt to the system. You probably don’t get a lot of time to yourself as it is, and now the whole house is beeping? What are you going to even do? Run out in the middle of the street with sopping wet hair and just a bathrobe or a towel wrapped around you? But smoke detectors are sometimes so sensitive that they’re set off by practically anything — including the steam that’s coming from the bathroom. The smoke detector may have won the first round, but it’s time to put yourself back in the driver’s seat from now on. It doesn’t take a chemistry major to know that steam isn’t smoke, so it may be perplexing to the average homeowner why this is happening to them at all. But thick humidity has a few characteristics that are similar to smoke, which means that it’s probably a more common occurrence than you realize. While a smoke detector is ideally meant to detect only combustible sources, it may be duped by the presence of thick air that’s clouding the detection chambers. Unfortunately, it’s impossible to give the detector a lesson about why humidity isn’t going to kill you and the rest of your family. It may make your hair a tad frizzy if you let it, but that’s not a reason to alert the fire department. This is usually the first step you can take to prevent an overly cautious smoke alarm. This way the humidity doesn’t even have a chance to reach the chamber, and you can continue to enjoy your shower in peace and quiet. While it’s possible that a fire may be started in the bathroom (from, say, a faulty electrical outlet or a powerful hair dryer), fires are much more likely to be started in kitchens or other areas that store major appliances. Put smoke detectors in the bedrooms, family rooms, and utility rooms so you’re still getting protection without risking the chance of the alarm going off every time you want to rinse yourself off. Older alarms have a tendency to become much more sensitive as they get older. 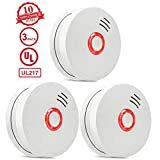 Unlike your standard teenager who will eventually mellow out with age, smoke detectors take the opposite route and start becoming more melodramatic as they age. It’s really kind of obnoxious when you think about it. 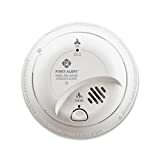 So if your alarms have never had a problem with humidity before but now seem to need constant attention to calm themselves down, then it’s probably time to replace your smoke detectors. Like most products on the market, detectors were never meant to last forever. Most experts will recommend having any smoke detector replaced that’s more than 10 years old — even if they happen to be functioning perfectly. Your smoke detectors should be a major part of your home security. 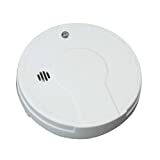 While break-ins and vandalism may be scarier situations to you than a sensitive smoke detector, odds are that the smoke detector will be more important when it comes to your general safety and well being. Make sure you have a fire escape plan in place — no matter what room you happen to be in when the detector goes off! If you have any questions about how to get a better home security system for everyone in the family, call Protect America today to get a free quote!